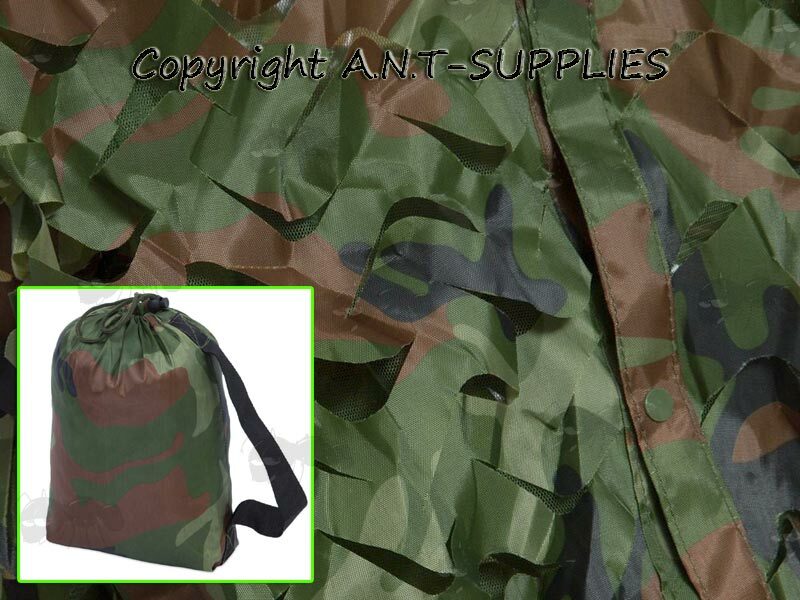 Woodland camouflage for hunting, airsoft or photography etc. We currently have three models available, we believe each is the best value for money in it's price range. 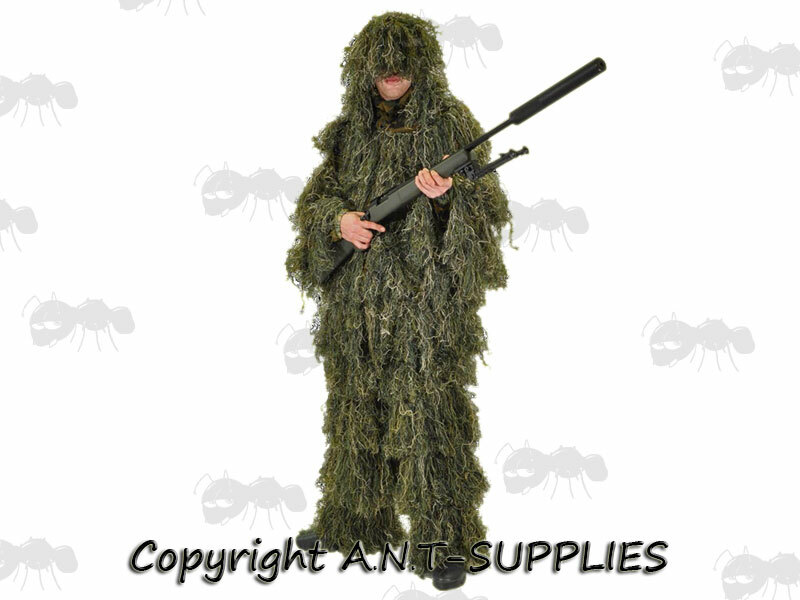 Also available ~ Gun ghillie wraps. 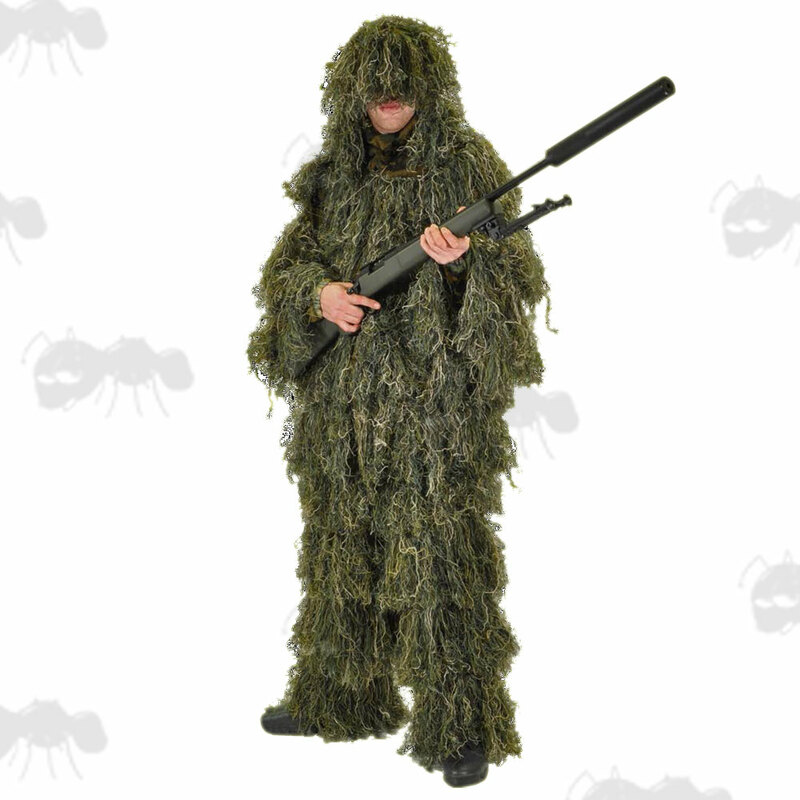 Next > Cybergun Ghillie Suit. Long jacket with sewn on hood, plastic popper fasteners and an elasticated base band. The hood has a sliding cord lock size adjuster. Long length trousers with elastic waist and leg ends. Cut 3D effect durable light-weight polyester fabrics, sewn onto a green fine nylon mesh framed work. Pre-made, so no assembly required. Size ~ medium to large. Trousers weigh ~ 190 grams. Jacket weighs ~ 280 grams. The stow bag weighs ~ 24 grams. The trousers have a waist of approx 37 inches. The jacket has a chest of approx 40 inches. Both the jacket and trousers can be made larger by cutting and extending the elastic or even replacing with a cord belt, as the elastic is tighter than the overall size. Long jacket / detachable hood / leg gaiters. Made from durable light-weight polyester fabrics. Rot / mould and fire resistant. Pre-made - no assembly required. Total weight in bag ~ 1650 grams. A Gille suit is a meticulously detailed, full concealment coverall. term Gillie/Gilly referring to a lad or servant acting as a gamekeeper.